Pinking shears! what an inspired idea! 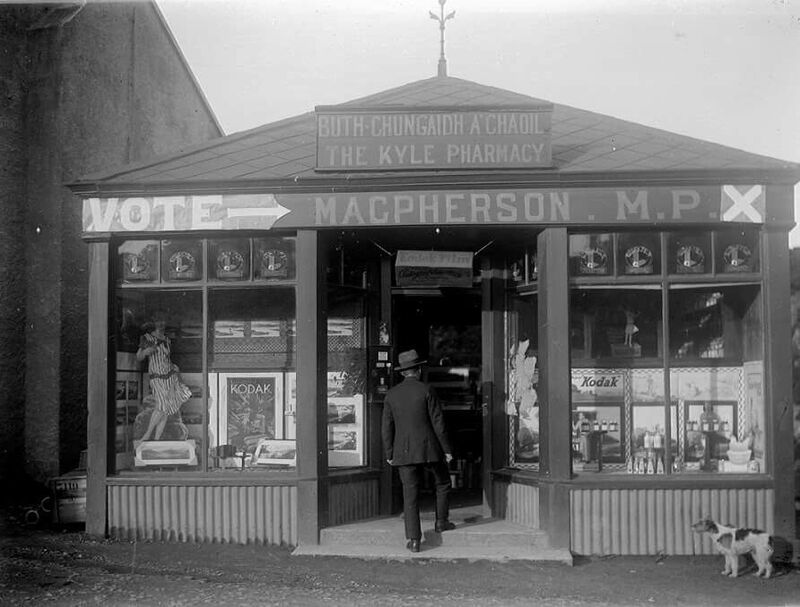 Just out of curiosity I Googled the pharmacy and found this 1930 image of the back (ironically, the image Google found is bigger) http://www.ambaile.org.uk/detail/en/11771/1/EN11771-kyle-pharmacy.htm. I can recall seeing asbestos slates used on building in Sussex which had a distinct dark pink tint to them, often used on timber clad bungalows. Sometimes almost a dark red but faded. Perhaps a regional thing or a different sort of asbestos? Having had to give up on trying to make something work, at least until tomorrow , I found these two on Pinterest [which I detest, because everything is divorced from its context, but I didn't find the originals] with dates given of 1920s and 1962 respectively, which at least seem credible. 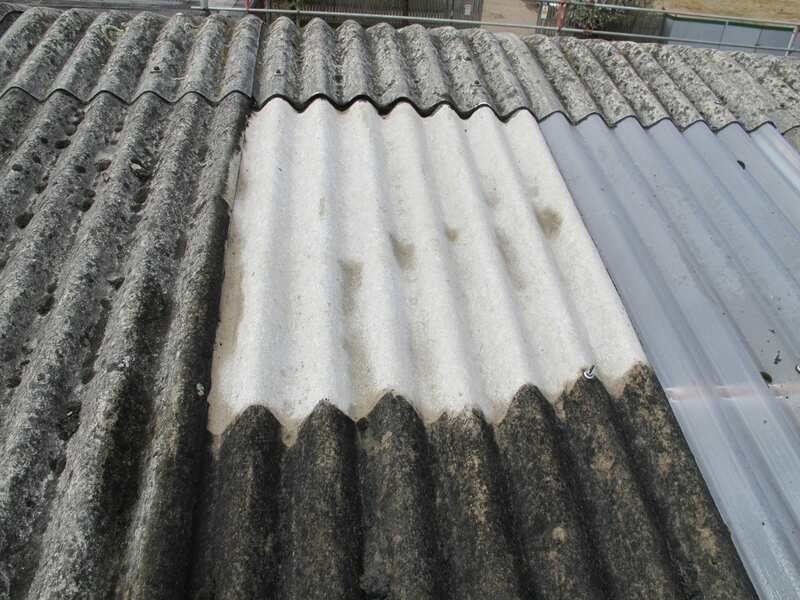 https://www.asbestosremovalists.co.uk/what-does-asbestos-look-like/ shows more examples, including a dark brown version, possibly a weathered dark pink as mentioned by Terry, but I think that the 1962 shot probably rules that out at Kyle. I assume you have seen some/all of these before, but I hope this helps. From Historic Scotland: The Pattern of Scottish Roofing. Not available as a download that I have been able to trace, but available online at https://issuu.com/hspubs/docs/res_report_-_the_pattern_of_scottis. As a sourcebook on Scottish vernacular architecture, this comes close to my treasured 'Buildings of the Scottish Countryside' - indeed, in some ways better by virtue of the plethora of colour images. Asbestos diamonds illustrated and detailed at page 162, and appearing to have a very slight mauve cast. The book page numbers and online page numbers are not matched, so look at online page 170 for the image John refers to. It also shows that the ridge material is unrelated to the slates [thin lead sheet? ], which probably explains the differences in appearance in the 1962 image I posted. Thanks to John and Noel. The book that John points us too is definitely helpful and will be bookmarked for future use. I have a couple of other Scottish vernacular architecture books which I will share details of when I get home over the weekend. The asbestos slates shown on page 107 (scan)/162(book) are the type I am looking to create. Whilst I would say that the slates in this picture have faded a lot (as have these https://i.pinimg.com/originals/d1/a9/0f ... ae977e.jpg), I think I am taking the point that my colouring is too dark (the blue tinge I think is a bit more in the photograph reproduction). I feel a bit more colour washing coming on over the weekend! Elsewhere in the book (including the frontspiece) has photographs of much larger slates that have the very reddish hue that Terry mentioned. As these things were man-made, I am guessing that each come from a different manufacturer and had a slightly different constituency. 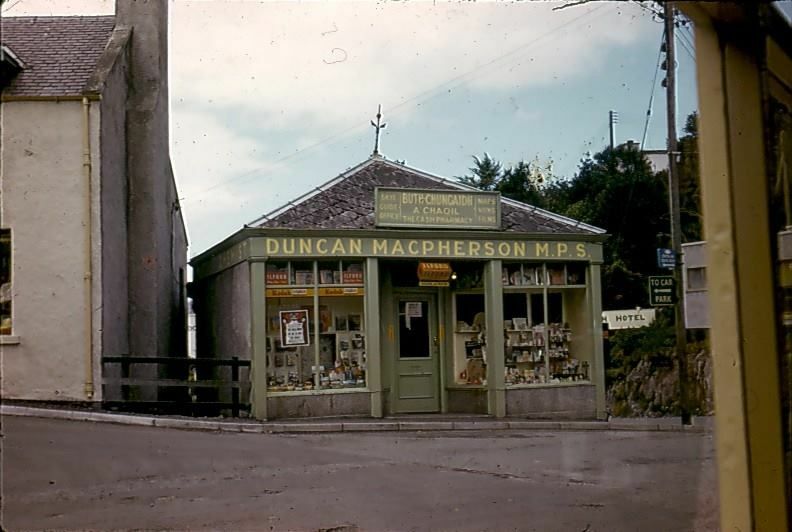 The B&W photographs that Noel have found are known of (they were taken by Duncan MacPherson who was the owner of the Kyle Pharmacy and has was a well known photographer of the area). They have formed the basis of the model. Rights are retained by the Skye & Lochalsh Archive and they want £40 per image to reproduce them. Given that the Archive exists to record and share the history of the area, I felt they were seeking such a sum for someone who is only (frankly) playing trains. I thought I would retain the multiple £40s to spend on some worthy trader at Scaleforum instead! However, I did not spot the biggest problem until it was too late. There is an error with the design of the kit ends where one of them is missing the top gap between slats. The correct end is as per the top picture and had I have spotted this prior to the assembly of the ends, I would have been able to insert the additional gap with a piercing saw. Having missed the problem until after I had built the van, I decided not to sweat the parts apart to cut in the slat. It only shows to those that know it is wrong; the problem is that I am one of them so it does niggle! Contrary to the instructions, I did not loose lay the floors in place and instead created a cage arrangement by hanging the floors from rods that were secured to the roof. As can be seen below, this enables the roof and the floors to be released from the interior of the van. This is necessary to both paint the vehicle but particularly populate it with the necessary sheep. You would be startled by how many sheep are required to fill one of these – around 50 and it costs a fair amount to populate each van. Thus, I have in mind casting some of my own in resin, although that is a story for another day. Fine looking vehicles (in both senses of the word). What would the braking system have been, manual, air or vacuum? Mark, as Australia rode on the back of a sheep for a large part of its economic history the State railways had similar wagons. The Victorian in both senses of the word had the "L" wagons for sheep. Later they developed the LL wagons... which it has been joked the lambs and lots of lambs wagons! A manual scotch brake actuating on one side to one wheel only. So well short of vacuum brakes! PS - just had a panic looking at the photo prior to responding - I have missed some end straps. Something to add tonight. Have attached a couple of pictures of the earlier Jones Diagram 9 Sheep van. Not the quickest kit in the world an certainly is a good soldering test. A couple of my modelling friends (whose blog you can find here - https://otcm.wordpress.com/) are in the process of putting together entries into a competition to build cameo layouts being orchestrated by the publishers Titfield Thunderbolt. To be fair to Oly, his entry is largely complete as long as he does not seek to tinker with it too much(! ), the same could not be said for Chris’s entry – titled Bottom Works Siding – so he has some catching up to do! To assist Chris I offered to make his signals and after a few weeks of work we have reached the point where they are complete. Chris’ model is based on the GCR’s route over the pennines at its Yorkshire end. It will represent a set of transfer sidings from the Woodhead route electrification to a industrial line serving a coking plant – so I suspect we will get to see a fair amount of grot in the finished article! Its signals are LNER or BR(E) practise which is mildly different to what I have built before in some regards but not others as there was a lot of standardisation between the LMS and LNER (and BR more or less adopted LMS practise). So first up is an LNER standard wooden post with replacement BR miniature upper quadrant arms. The post is a piece of brass square section that I filed to a taper (hard work) with predominantly Masokit’s fittings (which I found to be notably better than MSE’s equivalent). Mark, I know nothing about GCR ground signal practice [I presume L/Q], but the LNER used U/Q ground signals [one area of difference from the LMSR which used L/Q]. Also, again so far as I know, the larger light aperture was always, in all signals, for the green glass, as various factors could affect the position of the clear signal, so I think your disc is probably a U/Q one anyway. These may help. I was interested to see the date of introduction given as 1938 or later, which I didn't know. Noel wrote: These may help. I was interested to see the date of introduction given as 1938 or later, which I didn't know. Thanks Noel; although the line is being modelled in the early 1970's, so I still think I "could" have had the LMS ground signal; a LNER standard one has just arrived in kit form from MSE/51L. Guess what I am doing this weekend! Its going on a )) layout; so maybe the "getting it all right" is rubbing off?!?!? Although not Highland vehicles, these full brakes have a strong association with the Highland's branchlines in the post grouping years. Once the LMS took over the Highland's system in 1923, they seemed to have been horrified by the state of the coaching stock that they inherited! Portions of the Highland's fleet were speedily retired and large numbers of foreign company's stock was drafted onto the system (especially the main line from Perth to Inverness, where the trains became fully corridor connected almost overnight). The first iteration used a cleminson chassis but in the light of the success I had with sliding axles on some of my other 6 wheeled stock (NB, article with editorTim on this), I redesigned it to include these and some sprung W-irons in the style of Bill Bedford's. It is intended that this kit will be made available for sale as a 4mm/1ft model - albeit you will need to source the fittings/castings yourself. I have prepared some fairly extensive instructions and this includes the details of what is required and where to get it from. I am waiting for a quote from the etching company to be able to work out the sensible cost for these; so an update post will follow when I list it for sale. I'm intrigued with the sub assemblies. I would imagine this is pretty strong it's all assembled? Nice full brake there Mark. Might be able to help you with the ground signal, when designing the Palatine etch I took dimensions from the drawing in the LMS Journal and photographed several which were lying around by Bury signal box on the East Lancs Railway. I was also provided with some photos by Dave Kenton of our Manchester MRS and I am sure he won't mind me posting some of them here to help you get things right. I have to say I never expected to sell any of these etches (they, along with all my etches, are developed solely to help us with Slattocks) and so I never wrote any instructions but they have been popular with the professional model signal builders who have made quite a few. I hope these shots help. Yes, it is fairly durable - I tend to make all my models thus as I am a bit of a clumsey oaf if given a chance! The chassis is solid because it has an entire floor which is a sheet of metal and the solebars fold up off this (and are laminated). The roof is also a sort of tube with a plate at its base (which also forms the lip that is in reality a rainstrip at the head of the side). Thanks for the photographs Ralph. It was a neat little kit and a great deal elegant than the MSE/51L equivalent. Whilst Noel has pointed out I have built the wrong one (! ), I do have another layout I am to build signals for and it definitely has LMS standard ground signals, so I will probably be back for one or two more etches in due course!